Its been some time since we reviewed new stocks. The market have went down 20% and now have stabilized, but in all honesty its not really the stocks that I would bite. Perhaps a few years ago I would have bitten Sembcorp and Keppel due to the past write-ups but the more you do things the more you grew a dose of skepticism. So now I keep watch on some of the little companies around that most folks won’t want to buy. These are perhaps foolish investments to a lot of people. Transit Mixed Concrete is a little business in the space of construction and property industry. Their main business is in Concrete Pumping with less in Ready Mixed Concrete and Waste Management. They just release their half yearly results which can be seen here. Concrete itself looks like a challenging business that is tied to the cyclical nature of the economic cycle. You need more of it if there are more building and less of it when people build less. It also depends on the supply constraint as well sometimes. The bulk of the cost comes from transportation which can be a monster. Hence those companies with an advantage in this business is where they are also producing near their main clients, or that they can produce concrete cheap. If it is a good business we should see much attraction to Pan United. Concrete Pumping perhaps is a different business that is tied more closely with the building activity in the area of operations. If this is such a good niche business, and its low barriers to entry, given how good the construction sector is in recent times, we should see more entrants entering thus reducing the gross margins. Gross margins over the past 8 years have shown largely a U shaped trend. Should there be more competition and that transit mixed do not have any advantage, margins should stay largely at 20%, however things have been good. The concrete pumping div does show the same pattern as overall gross margins. The only conclusion I draw is that with more competition the data didn’t show a clear weakness in any advantage they have. Usually the two largest part of the cost other than the per unit expenses are the administrative expenses, and the capital expenditure. Very interesting business. Administrative Expenses stay largely controlled as revenue increases based on business. Notice that in 2009, 2011, and 2012 there have been more capex. It could be part of the recent better cash flow situation is due very much to lower capex. The years of 2009 to 2012 saw an increase in capex. Much of this might be to build up capacity since in 2010 they are operating at full capacity. It would seem that Transit build up much capacity to handle recent upsurge in demand, and these would still last them some time. The good point is that revenue have been trending up, yet the capex after the initial investment do not need to always scale up. I guess at some point they will need to replenish, so the cash flow we will need to factor in 4-5 years of massive replacements. Not sure about this but perhaps talking to management will shed some light here. I would have thought its a pretty cyclical business. However, it seems that their fortunes are more tied to the general construction climate of Singapore. If we rate by projects, it seems recent years there are LESS projects, gross margins for 2011 to 2014 was lower, and the capital expenditure was higher in 2009 to 2012. The more I look at it the more I drew the conclusion that Transit Mixed got higher value contracts, able to keep their cost controlled, and have invested upfront and now require less capex for this cycle. Hence profits are better. It will be interesting to see if that, we will come a case in 1998 to 2002 when the construction sector is absolute phish. If we think lesser HDB flats and condominiums is going to be bad for Transit Mixed then perhaps we are looking at it the wrong way, judging by the projects they engaged with. In the earlier years in 2010 and 2011, there were at least condominium projects while in latter years there were much focus on public and private non residential projects. With less of the public projects, the profits have gone down. So much of the value depends on whether there will be a robust development in public projects. The challenge in the future is that after 2017 there don’t seem to have a clear pipeline for industrial spaces, some office spaces and retail spaces, while we know there are going to be MRT Projects, Changi Terminal Projects, Port Projects and redevelopment of existing buildings. Earnings wise, Transit mixed hasn’t shown a consistent set of earnings, however, their dividend payout ratio have been good at 40% upwards. The dividends paid out shows prudence fin that they tend to pay out from free cash flow, even with some years where dividend exceeds free cash flow. If we tie everything together, that is, the historical set of projects, the nature of public to private projects, we might see years where there are less projects, there are upcoming years of more maintenance capital expenditure. While this year the dividend is forecast to be $0.04, with a 61% rise in dividends, I do not see evidence that this payout is a conservative payout to buy into. This means that at the purchase price of $0.51, I do expect in the future for transit mixed to pay out less than $0.04. The share price of Transit Mixed Concrete have risen from $0.30 in 2011 to $0.51. Even at 1.4 mil which is $0.02 dividend, the dividend yield at $0.30 is a respectable 6.7%. The top 20 share holders owned 90% of Transit Mixed. If you wanna get in it is difficult to buy. If you wanna get out when there are bad earnings, you may not be pleased with the price you are paying for. Top 3 share holders own 70% of the company. This is as much as I know now. Which acts as a good starting point to understand more about this company. The big investors will shunned this company because the total market cap is just SG$ 35 mil. $100,000 will make you the Top 20 share holders haha! I like that the cost is controlled and we do not see increase competition for such a lucrative industry. Generally the business have no debt with only lease obligations. The inventory and receivables scale with the revenue as well. There is a certain level of predictability since we know that there will be infrastructure projects, and redevelopment works. However, I am not comfortable buying at a price where it has already factored in forward looking increasing earnings and cash flow, which might not have taken into consideration that earnings can head down if there are less projects. For such a business, there comes a time when the earnings go down due to lesser work to be done, and thus the share price would go down accordingly. If they are still the well run ship as they are now, they should still pay a decent dividend. Perhaps 5-6%. That should be a good return to wait with the ramp up in future infrastructure works the call option to propel a higher dividend yield and capital appreciation. Always seek to understand the business, buy with conservative reward and let the upside take care of itself. The goal of many is to reach a stage of Financial Security, where you create alternate streams of cash flow so that you depend less on your main source of employment or business. The problem faced by many is a certain unwillingness to build up competency in wealth management, or that they lacked the time for it. Due to that, the only way to go about creating an alternate source of cash flow is property. Stocks is for punting and Bonds are unknown to them. This gets people dejected because a private property in Singapore cost $800,000 upwards. To start by putting down a 20% downpayment, you will need $160,000. Your wealth is also concentrated in 1 property. If you are rich that $800,000 is a portion of your net worth, that is good but not if your entire wealth is tied to one asset. My friend Chris at Growing your tree of prosperity likes to talk about the power of building up $300,000 in wealth. With $300,000 and put into 8% yielding stocks, a wealth builder gets $24,000/yr or $2,000/mth in dividend income. If you are frugal, $2,000 covers your subsistence living, or your Financial Security cost. You can chose to take a short break from work, you can choose to make a riskier shift in career. You have the backing of your Wealth Fund and Wealth Machine. My take? Stock markets go up and down. Recently, the Singapore stock market is down 21%, which puts it in an official bear market. 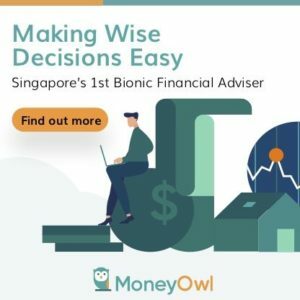 Having $100,000 of cash, bonds or Singapore Savings Bonds allows you to take advantage of these market fall to pick up high yielding income stocks at a large dividend yield. If you manage to pick up 5 stocks yielding 12%, your dividend income is $12,000/yr or $1,000/mth. That amount can cover a large part of your subsistence expense. As a gauge, what the CPF team used for their justification that is good enough for retirees with CPF Life is about $1,200/mth. I can think of how much a single person can offset a lot of his or her expenses with $1,000. 8% and 12% is not out of touch with reality considering the market fall and the list of stocks on my Dividend Stock Tracker here showing very attractive yields. 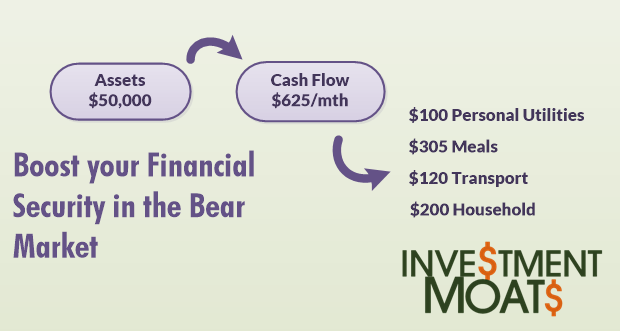 Even if you do not want to keep so much in low volatile and low yielding cash, bonds, having $50,000 around and taking advantage of 15% yield will give you $7,500/yr or $625/mth, it is very helpful to offset some household subsistence expenses. 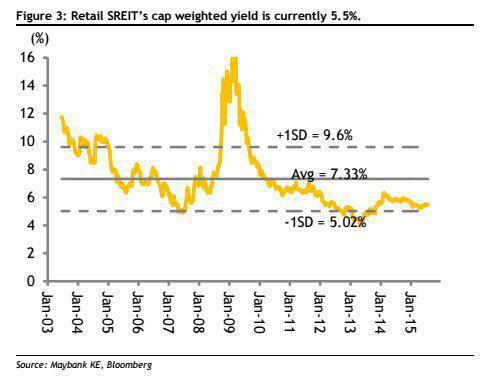 Here is the historical yield of retail REITs, which shows you that 12% and 15% is not out of the norms. My Dividend Stock Tracker will show that the retail REITs yield around 6% currently. One of the reason is that stocks in general go down due to the negative sentiments. It doesn’t mean that the business or the underlying assets have an issue. Good business, good assets go down with the bad ones because the mass of people trades and punts more, view things with short term thinking and they cannot bear with the pain. Capitamall was seen as a stable blue chip REIT now, and one of the largest in Singapore.It IPO near 2002 and the dividend yield was more than 10% because it was a bear market. Again, we revisit close to that level in 2009. The caveat here is that much of these high yielding stocks were a problem as well. During the hey days of 2006 and 2007 we have many banks engineering a packaged asset of things that traditionally income generating assets like trains, airplanes, aged healthcare. Most of the time there is nothing wrong with these assets. The problem is that the banks buy these assets at not cheap prices and inject it into the stock during IPO at even more expensive price. So an asset priced at $10 was producing an income of $0.60 for 6% yield. The $0.60 is produced during good times, and in normal times it produces only $0.40 or even $0.30. To have an attractive yield to attract you and me, the stock price will have to go down. Suffice to say, the stock investors got the short end of the stick. The share price of $10 fell to $3 or $2 which is what the stream of recurring income is actually worth. This is why IPO also means Its probably overpriced. Some asset managers like Allco and the Shipping Trusts such as FSL are more of finance managers who do not understand the real business of the underlying asset. After being put with better managers (Allco is being managed by Aims Amp as Aims Amp Industrial REIT, and FSL have management that are more tuned to the shipping scene), they manage to stabilize and even improve the prospects. The first 2 reasons are things to be careful about. Organic industry problems happens to good stocks but were beaten down because their outlook going forward is changing for the worst. Think of the property situation in Singapore looking forward versus in the past 10 years. Think of shipping before 2007 and versus after 2007. Some of these shipping trusts are not bad, however the industry outlook is so challenging that the worse likely will not survive and the good ones are struggling like mad. Pacific Shipping and the new look FSL Trust learnt their lesson and are doing very prudent management. However, the industry is so challenged. Purchasing a high yield stock during a normal market versus during a market drawdown is that, the former have risk situations that you have not thought of, and risk situations that almost everyone have not thought of. The dividend yield compensation is high but probably not enough given these situations. During a normal market, rising tides lift all boats, including the wobbly ones. If you do not think hard enough, and sometimes even if you do, you would think these high yield stocks are attractive. Conversely, during a bear market, it is likely all the risk situations that we did not see it coming, are laid out. Hence the share price fall. Buying in this environment leans you closer to an acceptable compensation for the risk taken. So if you have a REIT at 20% yield, even if the income is cut to 15% yield, it is still a very high return versus the traditional equity cost of capital of 10%. It definitely look better than buying at 6%! Many would have corrected me that property prices would have come down as well. However, if you are like me, who have an aversion towards concentration risk, properties in Singapore is a struggle. It is not like in the USA where you can buy properties at $50,000, $100,000 or $150,000. Buying listed assets such as REITs, business trust allows you to do that with $3000, $20,000, $100,000. Have all the risks shown up? I am unsure. I do not see the tightening of liquidity and more stringent lending affecting the business trust and REITs. To be fair many would have learnt form the challenging Great Financial Crisis. That made a lot of the risks visible and now prudent managers plan for it. However you still need competency to evaluate well so do pick up a book such as Building Wealth through REITs by Bobby Jayaratham which is quite a good primer or look through my resources section. I leave you with the thought of my friend who manage to snag Cambridge Industrial REIT when it reached 20% yield. $50,000 in it generates $10,000/yr. How are you going to find that in Singapore properties? Think of what $10,000/yr can do for you to supplement your daily life. It doesn’t buy you freedom, but it moves you closer to there. I got to know about China Mobile as a dividend stock while research some of the top international telecom dividend companies in the world. China Mobile was an asia representative and what caught my attention is that it mirrors that of Vodafone. Singapore investors would be glad to know that you can easily trade or get invested into China ADRs such as China Mobile on the SGX via your brokerages such as POEMS, Kay Hian and Lim and Tan. You can get dividends from this ADRs as well, but from what I Know with-holding taxes on dividends still applies. Dividend Aristocrats index measures the performance of large cap, blue chip companies within the S&P 500 that have followed a policy of increasing dividends every year for at least 25 consecutive years. Lets take a look if fundamentally China Mobile is able to satisfy that. China Mobile Limited, an investment holding company, provides mobile telecommunications and related services primarily in the Mainland China. The company offers various services, including local calls, domestic and international long distance calls, intra-provincial roaming, inter-provincial roaming, and international roaming services; and voice value-added services, including caller identity display, caller restrictions, call waiting, call forwarding, call holding, voice mail, and conference calls. It also engages in data businesses, which include short message services, wireless application protocol, and multimedia messaging services, as well as color ring services that enable users to customize the answer ring tone from various selection of songs, melodies, sound effects, or voice recordings; and provides various data products, such as Java applications, IVR, and PIM. In addition, the company offers agricultural information services; telecommunications network planning, design, and consulting services; roaming clearance services; technology platform development and maintenance services; and mobile data solutions, and system integration and development services, as well as operates a network and business coordination center. As of December 31, 2009, it served approximately 522.283 million customers. The company was formerly known as China Mobile (Hong Kong) Limited and changed its name to China Mobile Limited in May 2006. The company was founded in 1997 and is based in Central, Hong Kong. China Mobile Limited is a subsidiary of China Mobile Hong Kong (BVI) Limited. China Mobile is one of the largest mobile telecommunications company in the world by virtue of having the world’s largest subscriber base with the potential to grow further. China Mobile has this and its hard to see it go out of business. however that doesn’t mean it will not run into trouble as license auctions and capex are 2 major operational risk that an investor would need to watch closely when investing in China Mobile. Figure above shows the capital expenditure, free cashflow and free cashflow minus dividend payout for the past 10 years. Notice that all are consistently rising. There is not a single year where free cashflow have been negative. The significance of using free cashflow is that it takes into account capex and depreciation and that is the cashflow that China Mobile can pay investors. The last payout ratio was 41% of net income, which is very good. Although it has to be said that most dividend aristocrats have a payout ratio of less than 30%. As a note, dividend have been increasing which is encouraging. Due to competitiveness in the industry, profit margin have been falling. We should expect it to continue to fall. This typically means that growth will slow down and in the past many dividend aristocrats get into this phase of growth and have a chance to stop increasing their dividend payouts. ROE is a healthy 40%, while ROIC is much higher at 80% since we calculate that by taking out the cash. China Mobile currently has 264 billion RMB as cash and equivalent. This amount is 35% of its assets and 18% of current market cap. In summary cash holdings is very healthy. Debt to Asset Ratio is 1.3% which is negligible. Debt Coverage, which is define by debt/operating cashflow is 0.05, which means that it takes almost less than 1 month to clear its debt. At current price of USD 52 for the ADR, PE is is almost 7 times. PTB is 2.78 times. Price to sales is 3.26 times. I tend to favor EV/EBITDA for strong cashflow companies but this and the PE does make it seem that this stock is cheap. However PTS and PTB looks fair value. I think China Mobile at USD 52 presents a good price for you to look at. Its not overly cheap but considering that it is one of the largest telco in the world and have the potential for rising dividends. This could be something worth investigating.